Set amongst the quiet back streets, away from the bustling main roads of Tunbridge Wells, you’ll find the gorgeous One Warwick Street. A location Rachael and Adam had their eyes on from the moment they decided to have a wonderfully intimate wedding celebration. Spending such quality time with their close family and friends is something that Rachael and Adam hold very dear, and it meant more time spent with the people that are dearest to them, and who had travelled from all over to be able to witness such an incredibly special moment. Something I’m actually starting to see a little more with weddings these days. The day itself broke away from a lot of the norms of a wedding day, which is so refreshing from time to time. In this case it meant that both Rachael & Adam were going to be getting ready in the very same spot, so could both enjoy the so called butterflies together, and the art of calming each other down. But they’d also designed the day so once the ceremony and wedding breakfast had finished, they could just have a few quiet drinks with their special friends, then slowly drift off to the Cotswolds to celebrate this awesome moment together in the quiet of the countryside. What a lovely wedding story this has been, and a total privilege to be a part of. Knowing how private and intimate these sweet souls are, it makes it all the more special to be part of their wedding day celebration. 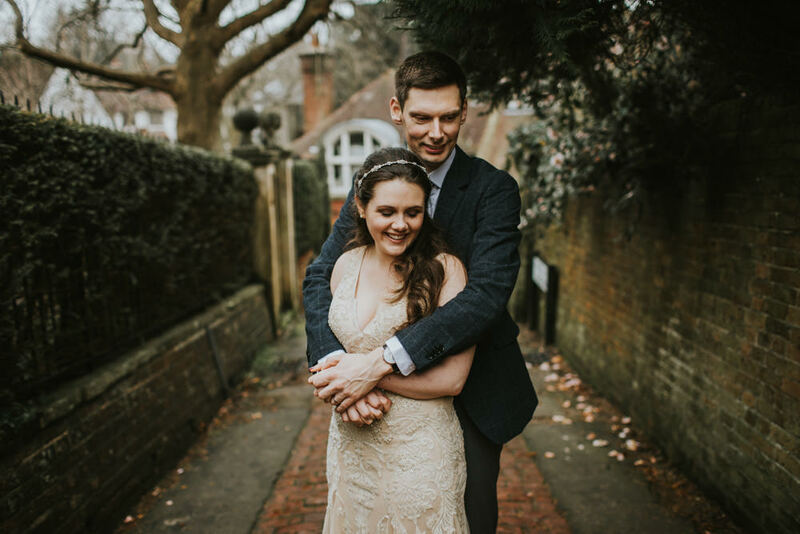 Watching them both, not only say the all important I-do’s in front of family and friends in floods of happy tears, but also exploring the moody back streets of Tunbridge Wells with the softest of winter light. A truly perfect setting to celebrate such a special moment for two such lovely people.